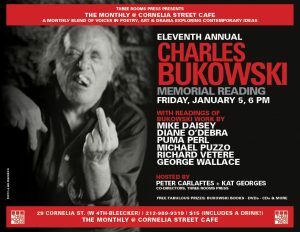 Join us for our monthly event in January 5th 2018 at The Cornelia Street Cafe as we have our special reading in memoriam to Charles Bukowski. Come and celebrate the turning of the New Year with Three Rooms Press for the Eleventh Annual Charles Bukowski Memorial Reading at the Cornelia Street Café on Friday, January 5, 2018 at 6 pm! The highly anticipated yearly event is hosted by Three Rooms Press co-direcotrs Kat Georges and Peter Carlaftes and features a collection of poetry, oral history, rare videos, and readings from various authors. Held since 2008, the event will feature performances of Bukowski poems and tales by a unique cast of talented fans including famed monologist Mike Daisey, world-renowned poet George Wallace, playwright/novelist Richard Vetere (Champagne and Cocaine), playwright Michael Puzzo (Spirits of Exit Eleven), poet Puma Perl (Retrograde), and performance artist Diane O’Debra. Admission is $15, which includes a free drink. Charles Bukowski was considered the champion of the outsiders, the lost, the lonely, and the outcasts of society. His work is still vividly relevant today. Overall, Bukowski wrote about the human condition, something that can be applied to any time period regardless of changes in technology, politics, or societal conflict. Doors open at 5:45pm (for best seating please arrive early). All attendees have a chance to win Bukowski books, CDs, DVDs, and other prizes. A limited open mic will be available for audience members wanted to share their personal favorite Bukowski poem. Cornelia Street Café is located between West 4th Street and Bleeker Street. For more information, you can call 212-989-9813 or visit (http://corneliastreecafe.com/). Additional information and reservations can be made at info@threeroomspress.com. For additional press details, including photos, interviews and press passes, please call Peter Carlaftes at 212-731-0574. Mike Daisey is an American monologist, author, actor and raconteur best known for his extemporaneous monologues about Nikola Tesla, L. Ron Hubbard, Steve Jobs and Apple’s supply chain in China, the Department of Homeland Security, the history of the New York transit system, 9/11, the inventor of the neutron bomb, Wal-Mart and a variety of other topics. He has recently been touring nationally with his new monologue, THE SECRET WAR about Daniel Ellsberg, Chelsea Manning, Edward Snowden, and the evolution of our secrecy state. George Wallace is an American jazz poet, known for his energetic and rhythmic voice. He has over 43 collections of his work published to date, including two full-length collections on Three Rooms Press (Poppin’ Johnny and EOS: Abductor of Men). He was most recently honored as poet laureate of Ditet e Naimit Poetry Festival in Tetova, Macedonia and has been selected as the 2018 recipient of the Gold Medal Alexander the Great Prize awarded by the International Cultural Association “Café of Idease” under the auspices of UNESCO. Richard Vetere is an American playwright and screenwriter whose work has received international critical acclaim. He is the author of the play Last Day, and a novel, Baroque, about Caravaggio and the people he painted in Rome. His authored a recent poetry collection, The Other Colors in a Snow Storm. Movies include The Third Miracle (produced by Francis Ford Coppola), How to Go Out on a Date in Queens, and the cult classic, Vigilante. His most recent work includes his highly-praised novel, THE WRITERS AFTERLIFE and CHAMPAGNE AND COCAINE –both Three Rooms Press. Diane O’Debra is a performance artist, comedian and actress known for her duo with her twin sister, The O’Debra Twins, which won a Village Voice Best of New York Award and received ECNY Award Nomination for Best Duo. Peter Carlaftes is a New York-based publisher, playwright, actor, poet, and editor. He is the author of 12 plays, including a noir treatment of Knut Hamsun’s Hunger, and the celebrity rehab center spoof, Spin-Dry. He has appeared in numerous Off-Broadway productions, including his comic solo performance piece, Lenny Bruce: Dead & Well, As an author, Carlaftes has penned five books including A Year on Facebook (humor), I Fold With The Hand I Was Dealt (poetry) and the play collections and Teatrophy (3 More Plays). He is a co-director of Three Rooms Press. Kat Georges is a New York-based poet, playwright, performer, and designer. In New York since 2003, she has curated poetry readings, performed widely, and written and directed numerous Off-Broadway plays (including Jack Kerouac: Catholic by Larry Myers, and The Old In-and-Out, by Madeline Artenberg and Karen Hildebrand, and ANTI, by Peter Carlaftes). Books include Slow Dance at 120 Beats a Minute, Punk Rock Journal and Our Lady of the Hunger, as well as her upcoming collection of plays, Three Somebodies (to be published in March). She is co-director of Three Rooms Press.